Windows 10 is vigilant when it comes to reminders and notifications. Microsoft has tried to make the whole user experience perfect from their side with the notification pop-ups thanks to Action Center but in reality, these notifications are quite annoying and extremely distracting for some users. This is the reason why this operating system also has a way to disable these notifications for all the applications, stop notifications of individual applications and even disable these notifications temporarily. Step 1: Click on Start Menu and locate the Settings app icon (white gear). You can also open the app with ‘Windows + I’ key combination. Step 2: From Settings, click on System and then select Notifications & Actions from the left panel. Step 3: Toggle off the radio button with the label ‘Get notifications from apps and other senders’ to disable notifications from Store apps and desktop apps of Windows 10. Step 1: Go to the Settings app from the Start Menu list. Follow the path System -> Notifications & Actions. Step 2: Go to the section ‘Get notifications from these senders’ in the right panel. This section has a notification on/off button for Windows desktop apps, system features, and Store apps. Step 3: Toggle off the notification button for any app whose notification you want to disable. Note: This option only works for traditional notification method using apps. Other apps show their notification in custom bubbles and need to be disabled from the apps directly. Simply open the app, go to its settings and turn off the notification option. In the Falls Creators Update, Windows 10 introduced the ‘Quiet Hours’ feature which was renamed in April 2018 Update to ‘Focus Assist’. It has introduced a new mode in Windows 10 called ‘Do not disturb’. The Quiet Hours / Focus Assist disable the notifications temporarily whenever it is turned on. Quiet hours were by default set from 12 AM to 6 AM in the Falls Creators Update. However, with the April 2018 update, you can customize the hours according to your desired time range. To configure the Focus Assist, go to Start Menu and open Settings app. Select Focus Assist from the left panel and click on ‘During these times’ option. In here, turn on the option and then enter a start time, end time, repeat and focus priority level. Check ‘Show a notification in action center when focus assist is turned on automatically’ to keep track of the feature. You can also turn on focus assist from the Action Center directly. Click on the icon of Action Center located on the extreme right of Task Bar. If you see only four tiles in the Action center then click on ‘Expand’. Click on the tile with a crescent icon and focus assist text to enable it. There are two modes of focus assist here that can be enabled by one click or double-click. The first one is activated by a single click and is ‘Priority Only’ while the second one is ‘Alarms Only’ and it is activated by two clicks on the tile. So, these were some methods through which you can easily change the notification settings of Windows 10. 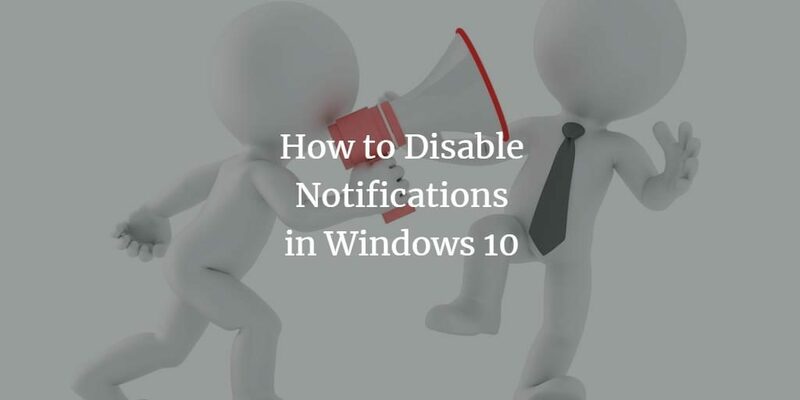 Let us know which of the above-mentioned methods you utilize for disabling these pesky notifications on your PC in the comments below.